Among the products marketed by ESAF there is also a wide range of sheathed mineral insulated resistors. These products can be used for temperatures up to 75°C, they have a mica and aluminium cast insulation and come with a cooling circuit. These heating elements are able to provide a uniform distribution of heat while maintaining significant surface density. Esaf’s well-stocked warehouse has a wide range of models. Used for heating drums, barrels, tanks, these thermal resistorscan also be used for the heat treatment of large diameter pipes. 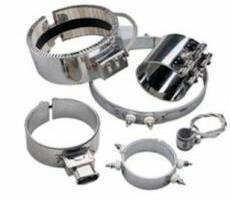 These elements, in fact, are composed of a pair of strip heaters and stainless steel tightening bands. Thanks to the perfect adhesion of the clips to the surface to be heated, the heat transfer is always constant, prolonged and efficient. The benefits of buying Esaf’s band resistors are countless: high exposure temperatures and maintenance, power, high abrasion resistance, unlimited duration. All of the company’s products are subject to very strict quality controls and inspections aimed at verifying optimal efficiency; this is why more and more customers decide to rely on the competence and professionalism of ESAF. Band resistors with mineral insulation for temperatures up to 75°C. It has MICA insulation and an ALUMINIUM cast, and even comes with a cooling circuit.